(Newser) – Yellowstone wolf-watchers are mourning Lamar Canyon Wolf Pack member 926F—a she-wolf better known as "Spitfire." The 7-year-old wolf was legally killed by a trophy hunter in Montana just outside the park's boundary, the New York Times reports. 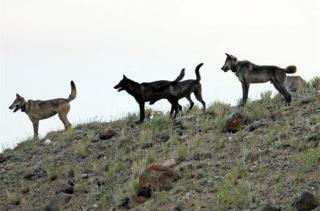 Spitfire's mother, known as the "most famous wolf in the world," died the same way in 2012. The mother, 832F, was an alpha female nicknamed "06" who became the subject of a book, American Wolf: A True Story of Survival and Obsession in the West. There are around 100 wolves spread across 10 packs in Yellowstone, and wildlife advocates have called for a "buffer zone" around the park to protect the Yellowstone wolves, who have little fear of people. Time to put a price on ball sacks of trophy hunters. Ten for a nickel. They were absolute FOOLS for taking wolves off the Vulnerable or Endangered lists! Petition: https://theanimalrescuesite.greatergood.com/clickToGive/ars/petition/IdahoWolves They still need protection!